The election of Donald Trump as America’s president has shed new light on something called the “deep state.” This term, which was first widely used in the case of the Republic of Turkey, specifically after the Susurluk car crash of 1996, denotes that part of the American government that is unelected and will never stand for election. These intelligence operatives and decades-long veterans of departments like the FBI, State Department, DHS, etc. are sometimes seen as the tireless defenders of American security at home and abroad. Except, when they are labeled as the “deep state,” they are loathed for their corrupting influence, their oligarchic control of state power, and their steadfast devotion to failed American policies, both foreign and domestic. Author Bill Rapp is a veteran of this world. Recently retired from the CIA after 35 years of service, Rapp has all the markings of a man who could write a great espionage thriller. After all, you don’t put in work as one of Washington’s senior managers and diplomats for so long and come away empty handed, right? 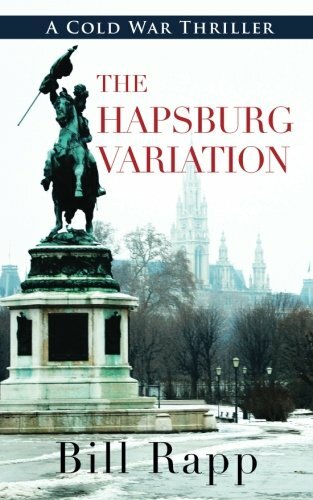 Well, The Hapsburg Variation is an indication that Rapp knows his stuff, but has a lot of work to do when it comes to fiction. This novel, which is the second in a series featuring CIA operative Karl Baier, takes place in postwar Vienna. This city, which was immortalized on film in The Third Man, is about to be free of its Allied occupiers. This should be cause for joy, but the Americans and the British are wary of trusting the Soviets, especially when it comes to voluntarily leaving Central Europe. Matters are further complicated when the body of an Austrian aristocrat named von Rudenstein is found in a Wehrmacht jacket one frosty morning. The murder of Herr von Rudenstein sets off a minor panic that takes Baier from Vienna to Hungary and all the way to London. Along the way, Baier’s wife is abducted by a foreign intelligence service and a former member of MI6 winds up dead, despite his lonely retirement in the cold north. Can it all have to do with von Rudenstein’s secretive plan to reestablish the Hapsburg Empire? Or is there something at work here that stretches back to the numerous crosses and double-crosses of World War II? The Hapsburg Variation is a labyrinthine story that may or may not present the world of covert espionage as it actually is. If this is true, then working for the CIA or MI6 must seem like getting stuck in a world of funhouse mirrors—no one and no service can be trusted with the naked eye. As fun as this novel is, the major downfall is that Baier is such an unlikable character. He’s snotty and prone to sarcastic jibes about World War II. He is especially vicious to his British counterparts, who, during the time of this story, are facing an internal row after the Cambridge Five scandal exposed the fact that MI6 was rotten with Soviet double agents. Baier is what could be accurately called an “ugly American,” for despite his education, Baier seems to think that only America and American liberalism hold the answers for a war-shattered Europe. Rapp’s novel is an entertaining read, but can be hard to follow at certain points. That said, if you like historical asides in your fiction, then The Hapsburg Variation is the book for you. This spy thriller is so imbued with history and the global politics of the 1950s that it feels at times more like a fun history paperback than a Cold War detective story.